In this rich and resonant work, Soren Kierkegaard reflects poetically and philosophically on the biblical story of God's command to Abraham, that he sacrifice his son Isaac as a test of faith. Was Abraham's proposed action morally and religiously justified or murder? Is there an absolute duty to God? Was Abraham justified in remaining silent? 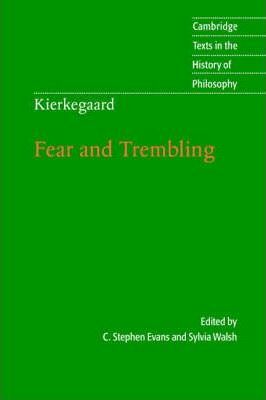 In pondering these questions, Kierkegaard presents faith as a paradox that cannot be understood by reason and conventional morality, and he challenges the universalist ethics and immanental philosophy of modern German idealism, especially as represented by Kant and Hegel. This volume, first published in 2006, presents the first new English translation for twenty years, by Sylvia Walsh, together with an introduction by C. Stephen Evans which examines the ethical and religious issues raised by the text. Epigraph; Preface; Tuning up; A tribute to Abraham; Problems; Introduction; Problem 1; Problem 2; Problem 3; Epilogue. "...the reader who thinks to wait for the next 'better' edition and translation of this remarkable text will be almost certainly be waiting for quite some time." Stephen Evans is University Professor of Philosophy and Humanities at Baylor University. Sylvia Walsh is Scholar in Residence at Stetson University.